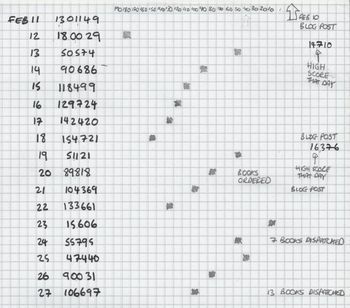 Its always a sign you're getting over-involved in something when you break out the graph paper. I think it's all fairly self-explanatory, if you can be bothered with it. The tracker reports every three hours, but I've only graphed one per day. (Noting on the right if I managed a higher score at any point during the day.) You'll see I ordered the twenty books on the 20th. Seven were dispatched on the 24th (which are now on their way to some people) and thirteen were dispatched today. All I think I can learn from this is that mentioning the book on the blog seems as, if not more, effective, as ordering and paying for twenty of the blighters. And, if I've mislogged anything, got my scales wrong, or committed some crime against statistics or information design I can only apologise. It's late and I'm old. I've been staring at your graph for 5 mins and can't work out what's going on at all. Now I feel a bit thick. Maybe your blog mention was much more powerful than your own purchases. Maybe the blog mention drove hundreds of people to buy the book, which meant that your own 20 purchases would not have much effect. Perhaps people did not want to abuse your generous offer, so they went out and bought the book themselves.